Virtual reality isn't just a vessel for awesome gaming experiences. It can also be used for some innovative and useful tools, which is exactly what we're seeing from Ikea with their VR experience. The Ikea VR Experience, as it's called, allows users to explore a virtual Ikea kitchen in real-world size through a HTC Vive. 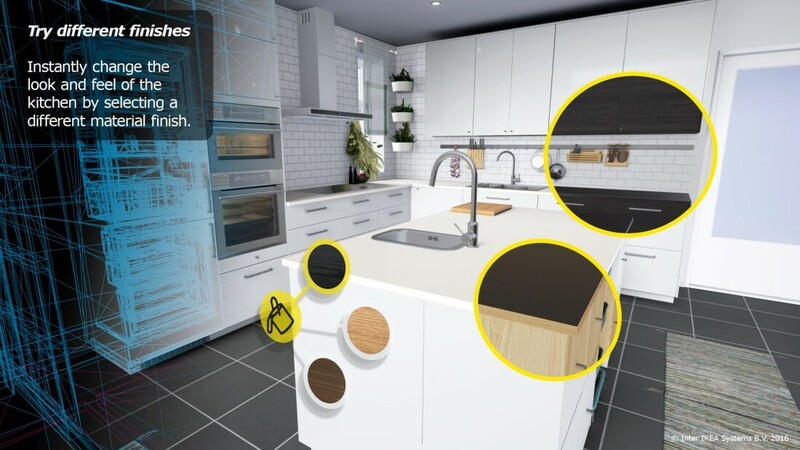 As the Vive is well suited to moving around in VR, it makes the perfect choice for Ikea's tool, which gives users the ability to change the colors of cabinets and interact with various items in three pre-designed kitchens. Users can also shrink down to the height of a child to see how well the kitchen would work for them. This VR experience isn't as robust as some of Ikea's other tools that allow prospective buyers to create entire room plans in 3D, but it is a lot more immersive and sets the foundations for something greater. Ikea plans on updating the tool continuously until the beta test ends in August, and the company thinks VR will "play a major role in the future of our customers" by allowing them to try "try out a variety of home furnishing solutions before buying them". The app itself is available now through Steam for free, and requires a play area of around 2 x 1.5 meters. It was built by French company Allegorithmic using Unreal Engine 4, and apparently requires at least an Nvidia GeForce GTX 980 to play, along with a HTC Vive headset.